Is the 50/20/30 Budgeting Method Always a Good Option? The 50/20/30 budgeting philosophy allots how much of your take-home pay goes to the different types of expenses in your budget. This budget rule can help you if you are trying to budget with a variable income. Each of the categories is divided into different priorities. The fifty percent is for your essential expenses, and the twenty percent if for your priorities, which leaves you thirty percent left to pay for lifestyle choices. This budget rule can help you keep your priorities in mind, and it is flexible, meaning if you do not spend all fifty percent on essentials, then you can assign that to either your financial priorities or to your lifestyle choices categories. It is important to understand how each of these categories is divided as you consider the budget. The essentials category covers your basic needs or necessities. In this category, you would include your rent or mortgage, your transportation costs (car payment, insurance, gas money), your utilities (electricity, water, and heat), and your food costs (but not eating out). The breakdown is a bit different from your traditional necessities category. It is important that you do not confuse your necessities with your luxuries when you are budgeting this way. Your priorities are the things that move you toward your financial goals. It is important to have financial goals no matter what stage you are at. 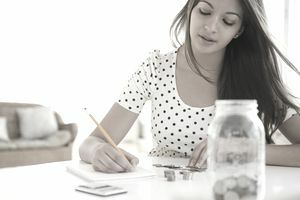 If you are struggling with coming up with specific financial goals, you may want to create a financial plan that can help you create a path to early retirement, home ownership or building wealth. These goals can be both getting out of debt and saving for specific reasons. You should be putting at least twenty percent toward these goals. However, if your debt (especially credit card debt, and student loan debt) is making it difficult to cover your basic expenses, you may need to adjust this percentage until you get your situation under control. With this budget, you get to spend the remaining thirty percent of your take home pay on lifestyle choices. This can be appealing because it means that you have guilt-free money to spend on the things you like. It is important to realize all of the things that fit into this category. Thirty percent may seem like a large portion of your budget, but it can be used up fairly rapidly. This category will include things like gym memberships, eating out, cable television, entertainment costs, vacations, and clothing. This philosophy will not help you manage your day-to-day budgeting tasks, like tracking your expenses. You need to select a budgeting system to do that. However, this can help you to gauge your spending and your priorities effectively. If you strive to put at least twenty percent of your income towards your goals each month, you can begin to see real progress. You can use it with other budgeting philosophies like the ​zero dollar budget. As you set up your budget each month, you can divide up the amount in each of the categories to see if you are on track with following this philosophy. If your spending and priorities are out of balance, you can take the steps to adjust them. You may find that you need to work at getting your essentials down, so that you can work on your priorities. If you have a large amount of debt, you will need to adjust the amount you spend on each of these three areas until you get it under control. It is important to remember that managing your budget and making it work will help you to reach your financial goals. Your budget is the best way you can make the money you do have work for you. If you have not budgeted before, you need to start as soon as possible. Budgeting takes effort, but it can help relieve financial stress and make managing your money a lot easier.